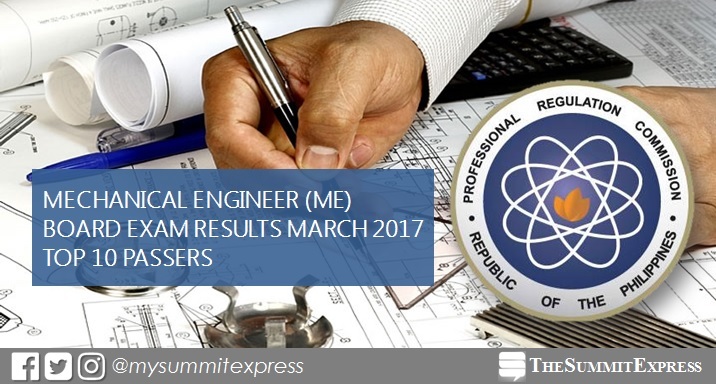 The Professional Regulation Commission (PRC) and the Board of Mechanical Engineering released the top 10 passers list (topnotchers) for March 2017 Mechanical Engineer (ME) board exam on Wednesday, March 22. It was followed by Polytechnic University of the Philippines (PUP) - Maragondon graduate Nino Rey Jacoba Caraig who got 87.80%. PRC conducted the licensure exam on March 18 and 19 in the cities of Manila and Cebu. In previous examinations, PRC did not release the list of topnotchers for Certified Plant Mechanic (CPM) except for September 2015 in which one school produced highest placer. In March 2016, University of Cebu (UC) graduates got the top 2 highest spots in the mechanical engineering board exam. In March 2015, Batangas State University (BatSU) alumni ranked first and second, respectively, with two more graduates obtaining spots in the top 10.